Delwyn Johnson, age 83, of Albert City, Iowa died on Sunday, January 27, 2019 in Storm Lake, Iowa. Funeral services will be held on Thursday, January 31, 2019 at 10:30 a.m. at the Evangelical Covenant Church in Albert City. Burial will be in the Fairfield Township Cemetery in Albert City. Visitation will take place on Wednesday, January 30, 2019 from 5:00-7:00 p.m. at the Sliefert Funeral Home in Albert City. The Sliefert Funeral Home in Albert City is in charge of the arrangements. Delwyn Carl Johnson, the son of Carl Francis and Gladys Lucille (Whitman) Johnson was born in Storm Lake, Iowa on May 21, 1935. Delwyn received his education in Albert City where he graduated with the Class of 1953. On September 13, 1958, Delwyn was united in marriage to Nancy J. Elg at the Methodist Church in Harcourt, Iowa. This couple was blessed with two children: Debra and Scott. Throughout this lifetime, Delwyn was a self-employed carpenter and operated Johnson Construction. He was a member of the Albert City Evangelical Covenant Church, where he and Nancy had belonged to the “Homebuilders” group. Delwyn had many varied interests which included hunting, fishing, playing cards, snowmobiling, watching sports on television, gardening, and socializing and having coffee with his friends. Delwyn and Nancy enjoyed the time they could spend at their cabin on Lost Island Lake near Ruthven. He will be remembered for building numerous houses in Albert City and traveling to his grandchildren’s ball games and activities. 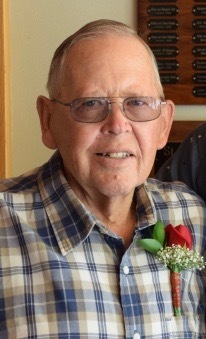 Delwyn’s life is cherished and honored by his family which include his children: Deb Johnson of Ankeny, Iowa and Scott (Deanna) Johnson of Ruthven, Iowa, his grandchildren: Cassi (Adam) Skog and their daughter, McKinley of Albert City, Iowa, Andy (Tacee Leebens) Johnson and their children Grayson, Crew, and Haven Adele of Pocahontas, Iowa, Evan and Callie Johnson of Ruthven, Iowa, his brother, Marlyn (Jeannine) Johnson of Manson, Iowa, a special family friend, Stacy Sime, other extended family and many friends. He was preceded in death by his parents, his wife, Nancy, one brother, Mervin, and his sister and brother-in-law: Marlyss and George Carlson.